Losing a tooth or teeth can be a blow to more than just your smile – it can also affect your self-esteem, your self-confidence and your health. Dental implants are the solution. Dental implants offer an effective, enduring solution to a problem that was once only treated using dentures and bridges. They allow you to you smile, talk and eat with confidence, knowing your replacement teeth look and feel natural. Our expert dental implant team are dedicated to restoring patients’ confidence with natural-looking replacements that are long-lasting. The crown – sits above the gum. The root – secured below the gum. During the process, the dentist will drill a small hole into the jaw bone to create a socket into which the small titanium implant is fitted. The gum is then stitched to cover the implant, and that area given time to heal so the implant fuses to the bone. The fusing, known as osseointegration, can take anything from eight to 20 weeks and is crucial for the long-term stability of the implant. 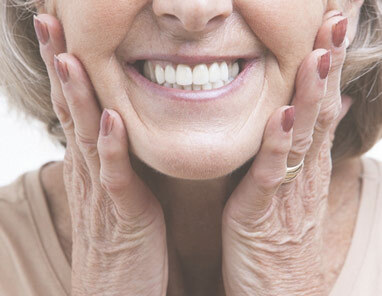 Don’t worry about being left with any unsightly gaps – we can give you replacement teeth by fitting a temporary crown, bridge or denture until the implant has fused. Once fused to the bone, the implant becomes a stable base for an implant post to secure a crown, bridge or denture in place. Precisely match the colour of your natural teeth. Feel just like one of your own teeth. Whether you have a single missing tooth, several missing teeth or no teeth at all, we can provide the right implant solution for you. Our team are leading experts in dental implant treatments and fully adhere to the Training Standards for Implant Dentistry, updated in November 2016, for both implant dentistry and for the implant training courses we run for other dentists. Raising the standards of implant dentistry and training courses ensures all dentists offering implant dentistry are highly skilled, knowledgeable and can deliver the best possible results. Click here to read the standards in full. Find out more about how dental implants can help you by contacting our Welcome Team on 01252 713797 or email info@elmsleighhouse.co.uk. Calls are recorded for monitoring and training purposes.